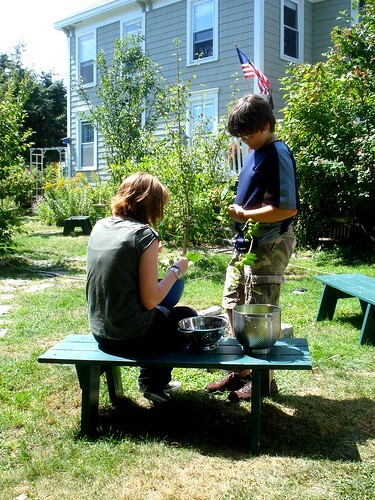 Though this summer has been very dry, unlike last year, which was so soggy, and our garden is certainly on the crispy-fried side, despite some evening watering, certain plants have thrived in the heat and sun. Like the Cascade Hops. In other, wetter years, the hops suffer through more pests, like spider mites and aphids and more disease, like downy mildew. 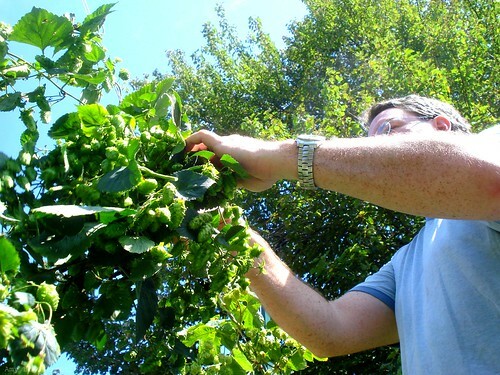 Drip irrigation, or low watering keep moisture off the growing hops, which helps to deter these pests. By stripping the growing vines of their lowest leaves, the aphids are further deterred from climbing the long way up to the leafy portions of the plant. 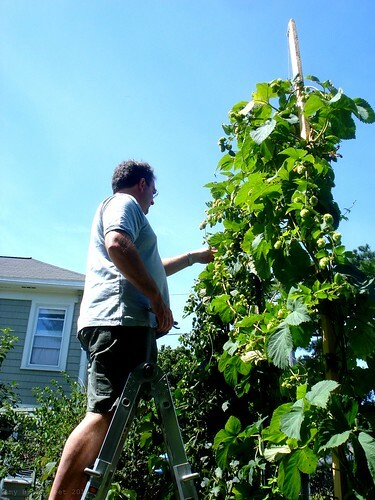 Alex, who is the Grower Of Hops and Grapes, built a couple of 12-15 foot poles for the hops to climb, but he says that even that wasn't tall enough and that he must build taller structures for next year. He also has some hops growing up and over our shed roof. The poles were cracked in June when the micro burst hit, but Alex managed to repair the poles and the hops were luckily, not damaged. Alex checks the hops continually once into August, to check for pests and disease, but also to see if the hops are ready to harvest. 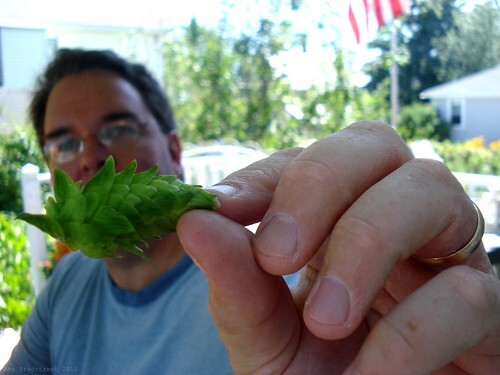 Once the cones feel papery, yet still slightly sticky and the lupulin, the yellowy powdery substance contained in the cone, comes off on his hands, which now smell of hops, he knows the cones are ready to harvest. This is one harvest that requires the use of a ladder. 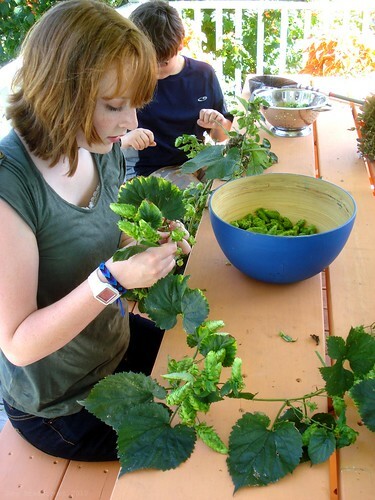 Once the vines were cut, the hops still had to be removed from the vines, so that's when the kids were very helpful. Each cone was carefully removed from the vine, examined and collected. 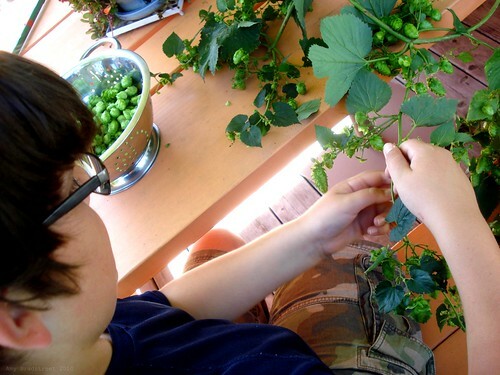 Hops have many uses, medicinally, but Alex's purpose in growing hops is home brewing. Instead of drying the hops, he freezes the whole, green, or wet hops in glass canning jars. When he's ready to brew, he'll use the hops, like this, which is called wet hopping. In Alex's experience, the dried hops really lose their flavor, the resin evaporates and the flavor isn't just as good. Plus, wet hopping saves several steps while ensuring that the eleven quarts of hops doesn't go to waste. Yes. Eleven quarts. My husband would be jealous -- our hops did poorly this year! We are in Washington and it was just too wet this past Spring and early Summer. Great harvest! Happy Brewing! Very cool! 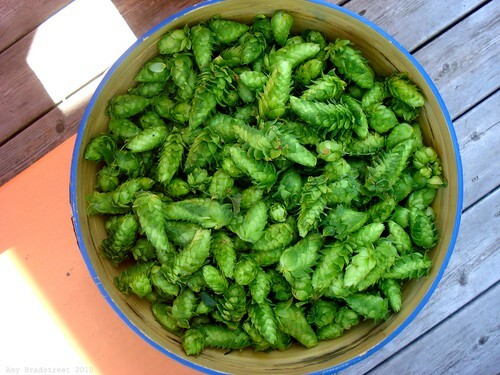 I am allergic to hops, so I will never grow them, but I never knew what they looked like. Thanks for sharing your photos.